Like drops of glass in a cobalt blue ocean, the islands of Maldives look like they exist in their own world. We fly over them, gaping at their rings of aqua blue, anticipating our toes in the sand at the edge of the water. We land in Malé – a solitary airstrip in the middle of the ocean — transfer to a speedboat, and soon find ourselves at the jetty of Olhuveli island. We’re introduced to Olhuveli by Azim, who thoughtfully explains the details of where to eat, everything to do and why we should pay attention to the currents when we’re swimming. But at this point we’re not paying attention to anything except the palm trees and island vibe around us, ready to sprint to our bungalow so we don’t miss a minute of today’s sunset. Our bungalow does not disappoint, with a spacious floor plan and perfect deck above the water that inspire us to imagine our dream house of the future. We sleep with the doors open, hearing ocean waves and the occasional splash of a big fish-little fish pursuit below the deck. Sharks, rays and tropical fish are abundant here. Beauty is the agenda of every day, to be savored at any hour – warm light at sunrise, illuminated water at midday, a vibrant eastern sky in the afternoon and an unpredictable sunset every evening. Even rain, fierce and forceful in the middle of the night, has never sounded more magical than from the sheltered perch of our overwater bungalow. We’re in Maldives on Boxing Day, marking the 10-year anniversary of the tsunami that decimated many coastal communities of the region. All the resort employees we ask tell us a story of where they were on the day – most of them so young they were on their native islands, in grade school at the time, let out of class in the midst of rushing water and debris. Some islands have yet to recover from the tsunami, but most have rebuilt. Because Maldives’ was close to the earthquake’s epicenter, comparatively small waves swept across the country before they had time to develop into the larger, more destructive waves that hit Sri Lanka, Indonesia and Thailand. On our last night in Maldives we dine at the seafood grill, in a glass hut set up for just the two of us, and choose a fish from the live tanks. The staff catches the fish and the chef prepares it masterfully, but it’s such a large catch we can only eat half of it. Sajid, our server, tells us it’s no problem — come back tomorrow and they’ll serve us the rest for lunch. Really? Really. No problem. We move on to the cultural performance happening in the main bar. 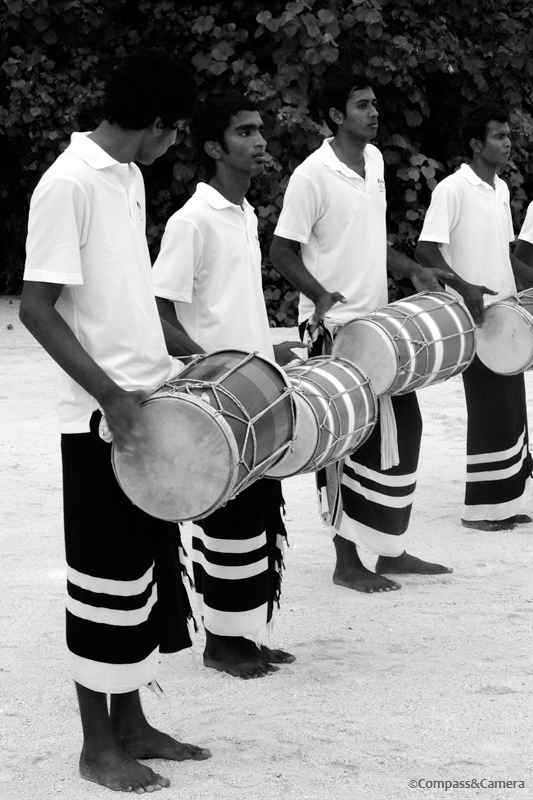 Resort employees are dressed in feylis, dancing and drumming, inspiring guests to get up and experience the music of the Maldives. It’s a perfect night, on a tiny island, in the Indian Ocean. Our vacation passes quickly but every hour brings a sight to behold, a view not to be missed. There are lots of activities to do, and there is nothing to do. Nothing is my favorite. The water mesmerizes, the clouds drift past and we dream of eschewing all other beach vacations if we can just return here someday. The spell is cast and the magic is real. FABULOUS!!! Photos are incredible and your description took me right there. So happy you loved it and returned safely. Thanks for taking the time to bring back ANY photographs – let alone these – when every moment was to be treasured. But hey, that’s what you do!!!!!! Great job. I’m in awe at the beauty you present here. It must have been so hard to leave; and I can imagine that you do dream of the day you can return! Thanks, Angel! Happy you enjoyed the photos. Oman posts coming soon — the other part of our trip. Ouch- so painfully beautiful! I question my priorities. Ha! …and also like furniture, probably best to replace with new ones when they get a little toooo comfortable! I just returned from a short vacation to a small island off the coast of northwestern Bali, and your photos remind me of the beauty of the sea — and make me crave for another tropical escapade. An island in the West Bali National Park called Menjangan Island where I did some really great snorkeling despite the slightly murky water due to the rainy season. I stayed in a nearby eco-resort and went kayaking across a mangrove forest as well. I will surely let you know the next time I come to Singapore! Thanks so much Randall! I was just reading your post on Tacloban — what an amazing trip, and poignant photos of all those beautiful children. Wonderful work! Thank you ~ travel to great areas always has a bit of a backstory that fascinates, and always full of great people. Sleeping with the doors open? Sounds like paradise! Did I miss this post? Oh, wait. I had just started blogging in January. Where’s the Mexican beer? I’m thinking of going to the Maldives (soon? later?). Do you think it best to stay on one island, or skip about? I do like Olhuveli…a fine place to just chill, eh? Oh, poop. I have a postit on my printer with this list: Bhutan, Seychelles, Maldives, Zanzibar, Madagascar, Tahiti, Tiblisi, Capetown, Myanmar. Bhutan and Maldives seem to be rising to the number one spot to go to. You had something to do with both!!! I think I’m beginning not to like you. You are forcing me to make a decision! So…thank you. The big yacht sounds cool. Let me know if/when you discover anything about it? Do you know its name? Can’t you just see a Badfish walking off the dock of his over-water bungalow onto a big yacht and sailing off into the sunset? !